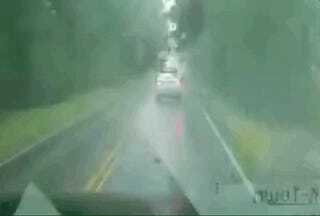 Yesterday afternoon, before Irma was downgraded to a tropical depression, a driver in Northern Georgia experienced the dangers of sharing the road with an inland tropical storm up close. This video was shot on Highway 92, in Griffin, Georgia, around 30 miles south of Atlanta, according to Beverly Lisle Head. Head posted video of the crash to her Facebook account Monday night. It was taken by her son’s dashcam. Baxter said she was traveling about 40 mph on her way to her sister-in-law’s house to meet her husband and stay for the night. “We live in a mobile home, so I was trying to get to safety,” she said. The woman said she was terrified about what was going to happen when she saw the tree start to fall. “I thought, ‘This is the end. I’m done,’” she said. Irma is currently in northern Alabama, and will continue northward as it weakens, raining down on Mississippi, Tennessee, Kentucky, and southern Illinois next. As always, stay safe out there.